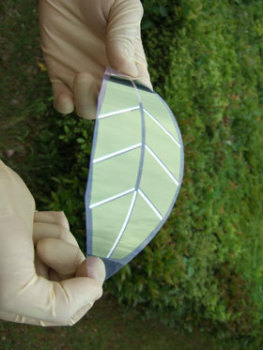 A collaborative venture between Mitsubishi Corp., Tokki Corp. and Japan's National Institute of Advanced Industrial Science and Technology (AIST) has given us an organic thin-film solar cell with a multitude of potential uses. 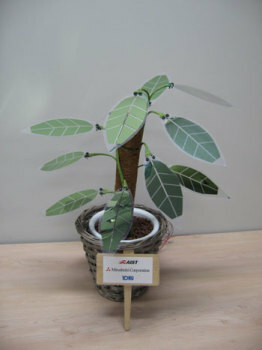 While only in the prototype stage at press time, the versatile, rugged solar cell module may find its first widespread use as an imitation houseplant that pumps out green energy while beautifying your décor. Not only are the new solar cells thin and flexible, they're protected by a layer of clear plastic which gives them the ability to stand up to use in busy, high traffic environments like homes and offices. "Bend me, shape me, any way you want me..."
They also have the potential to be used in building construction where instead of being applied to walls and windows, they would actually BE them! That's not all - consider the huge range of battery-powered toys, electronic devices, even clothing that could incorporate organic thin-film solar cells into their design. Need This New Invention? Knock On Wood! Just think how great it would be to plug your IPod into this and charge it using the sun. This is awesome. GO GREEN!!! i love it that japan would be one of the first to create products like this. simple to apply and use. wouldn't it be great if these could be stuck to the outside of buildings?? ?